Each year gamers get treated to a new version of the popular FIFA franchise unless you are an owner of an Android device, but today we have the news that FIFA 14 has been released for Android, although it does lack some iOS features. A few days ago EA released the iOS version of the app with Android users again waiting for its arrival, but the developer did provide a countdown for the games arrival which at the time had the title down to arrive on September 24th in the US and the 26th in the EU. Now though the game has been released in certain regions that include the UK Google Play Store, and FIFA 14 is available as a free download. This isn’t the full version of the game as players can upgrade which will get you access to this that adds three extra modes; Manager, Tournament, and Kick Off although some users have had issues trying to purchase it. 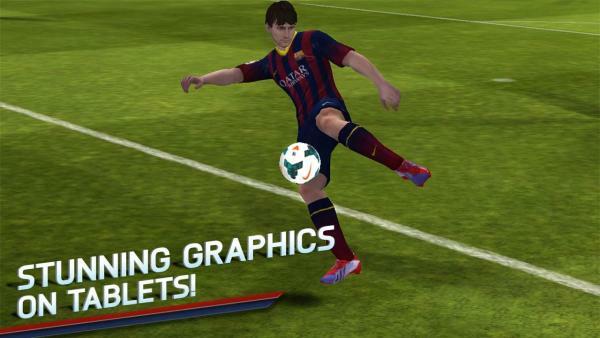 The game has been optimised with touchscreen controls for smartphones and tablets, and the game comes after there was no FIFA 13 released last year onto the platform. It brings with it improved controls and graphics as well as a better user interface, and users get access to 33 different leagues that feature over 600 teams containing more than 16,000 players. What will disappoint many gamers though is the fact that there is no online multiplayer mode which is always popular with FIFA fans, but you can head over to Google Play to download FIFA 14 and to find out more. I am unable to download in UK. It says not available in my country. I have a Nexus 4 and 7 (2012).